También conocida como: Pineau de la loire, pineau vert, pinot blanco, pineau d´Anjou, Rousselin & Tite de Crabe. 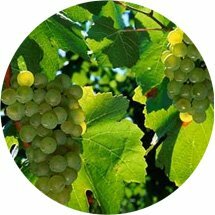 The Chenin Blanc wine grape is a variety of white wine grape original from the region of Anjou, (Loire Valley), in France. This wine grape its mainly used in France, South Africa, California, Argentina and Chile. In Spain the Chenin Blanc its authorized in Aragón and Cataluña, being part of the D.O. Somontano. The wines elaborated with Chenin Blanc are characteristic for being greeny-yellow coloured, with hazelnut aromas, sponge cake and poached fruits, besides a fruity flavour.